I'm just starting out in Bullseye and have a few questions about ammunition. Most of the ammunition available around here is 230 gr. 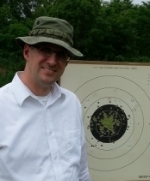 What is preferred for competition target shooting at 20 yds? I've seen some 200 gr. but the cost is almost twice as much as 230 gr. Why is that? If I were to reload, what would be an ideal bullet? Nobody I know uses 230 FMJ. 180 or 185 gr LSWC are good sizes for 20 yards but 200 LSWC would be ok too. Oregon Trail has 180s for 1000/$124. If 230 FMJ is cheaper, it would guess it's because of the number that are made. It looks like cast bullets are easier to find than powder at the moment. The preferred 45 acp bullets of bullseye, are lead semi wad cutter's in 160, 185 and 200 grain, available from a huge number of sources. Magnus bullet's has a good selection at fair prices. The next preferred but at a greater expense would be the 185 full metal jacket hollow points, best source zero bullets or nosler. If you don't reload you will find very few choices and at great expense compared to doing it your self. What prices were you seeing for those 200gr. If you are shopping between the same brand 230s vs. 200s the 200s should be cheaper--less material. I really like 200gr LSWC for my reloads. Very accurate, and they have the same zero from 50 yards to the 25 yard line in my gun. I was wrong about the 200 gr. They were actually Winchester 185 gr. flat nose FMJ and I paid $38.99/100. The Winchester 230 gr. round nose FMJ were $24.99/100. I don't know if this has anything to do with cost and frankly it doesn't make sense to me but according to a few formulas for reloading .45 ACP, it takes less powder for a 230 gr. bullet than for a 185 gr. bullet. I began the process (research) into reloading but my local gunshop didn't even want to sell me a machine because he said powder was practically impossible to find. He said check back in 6 months. I spoke with a rep. at Dillon and he said that yes, powder is difficult to come by but it is available. I looked around online and powder (apparently good stuff) is available but there are huge shipping costs involved. At this point I don't know what to make of all this. It's like a hundred different marbles bouncing around in my head. DavidR wrote: The preferred 45 acp bullets of bullseye, are lead semi wad cutter's in 160, 185 and 200 grain, available from a huge number of sources. Magnus bullet's has a good selection at fair prices. The next preferred but at a greater expense would be the 185 full metal jacket hollow points, best source zero bullets or nosler. If you don't reload you will find very few choices and at great expense compared to doing it your self. Magnus - Nope. According to their website they suspended all online orders because their "commercial customers are buying all they can produce". My favorite place to buy powder and primers is at a gun show. Usually there is some powder that is appropriate for bullseye - WST, Tigegroup, VV N310, W231. To start reloading, I would look at a Rock Chucker or Hornady single stage. For progressive presses, I'd choose Hornady or Dillon. I have a Hornady LNL AP that I like a lot. Contact Bob Parlermo at Penn Bullets and tell him what you are shooting and he will probably recommend his 200 gr LSWC bullets. AllAces wrote: Contact Bob Parlermo at Penn Bullets and tell him what you are shooting and he will probably recommend his 200 gr LSWC bullets. Any thoughts on the 152 gr. SWCBB? I think 152 gr would be a little light for bullseye, but who knows. Ask Bob if he will send you a few to test and his recommended powder load. I've also had good accuracy with Zero 185 gr Lead HP SWC's. Where do you guys purchase your powder and what do you recommend for .45 ACP? As I said before, I get usually get my powder at a gun show because I expect a greater selection and I don't have to pay a hazmat fee. I would prefer (in order): Bullseye, Vihtavuori N310, Titegroup, WST, and W231. YMMV. Getting powder these days is tough. I have not seen any Bullseye in 18 months. Recently picked up three pounds of N310 and some Clays at a LGS. I'm told Bullseye might be available by years end. There does seem to be plenty of rifle and shotgun powder. I have been seeing Red Dot so I was thinking of trying it when my supply of BE runs out (currrent estimate shows this to be at round number 1,571). AllAces wrote: Getting powder these days is tough. I have not seen any Bullseye in 18 months. Recently picked up three pounds of N310 and some Clays at a LGS. I'm told Bullseye might be available by years end. There does seem to be plenty of rifle and shotgun powder. I just saw 10+ lbs of Bullseye at my LGS. First time in a looooooooong time. Stick with a 200 or 185, 160 is the lowest I would shoot, go to midway usa and look at the lee pro 1000 in 45 acp, comes complete with dies, the low end Dillon Square deal does too. better yet go find a local bullseye match and watch and talk to the shooters for what they are using and where they shop for bullets/primers and powder. Correction - The cost shown for the ammo. in my earlier post is for a box of 50 not 100. But you guys probably already figured that out. Missouri 185 buttons. Always in stock and very accurate.